Of the many needs of human beings, proper shelter is right up there with food and water when it comes to importance. We rely on the walls of our homes to keep us safe from the outdoor elements, and it’s also here where we make some of our sweetest memories with loved ones. Despite the fact that your home is supposed to be a place of safety and refuge, the fact remains that nearly 4 million burglaries occurred each year from 2003 to 2007. It’s easy to dismiss the possibility, but it can and does happen. Furthermore, there are other risks such as house fires and natural disasters to take into consideration. An ounce of prevention is worth a pound of cure, and, while you can’t completely eliminate risks, there are some proactive measures you can take to better ensure the safety and peace-of-mind you deserve in your own home. It’s not the purpose of this home safety evaluation to convince you that gun ownership is right or wrong. However, if you’re open to the idea of owning a firearm for security purposes, it can give you the upper hand in the event a burglar ever tried to rob your home. It’s estimated that only around eight percent of citizens ever have to resort to shooting to kill or injure an attacker. This is because just seeing a weapon or hearing a warning shot is usually enough to send them running the other direction. Consider the purchase of a quality gun vault to keep your home safe. They lock securely and ensure your firearms don’t end up in the wrong hands. Allow children the opportunity to see the damage a gun can do as well as talk to them about gun safety. Consider enrolling children who are of proper age in a gun safety course where they can develop a better respect for firearms. From 2010 to 2014, fire departments in the United States responded to an estimated 358,300 home structure fires each year during the period. These situations hit quickly and often without much warning. Once a fire has overtaken your home, there’s little you can do than wait for emergency personnel to arrive as your home goes up in flames. If you haven’t already, install smoke alarms in each level of your home. Inspect and test your alarms monthly. Create a fire escape plan and ensure the entire family has practice employing its use. When you have a storm shelter, you can take refuge the next time severe weather strikes, and you can even have them installed within in your home to help you seek safety quickly and efficiently. There really is no place like home. In fact, many people even find themselves homesick when they’re off on vacation enjoying exotic places and experiences. In our homes, we have everything we need and are able to enjoy our free time doing whatever it is we find enjoyable. We can also truly be ourselves without having to hide the layers we’re often hesitant to reveal in public. 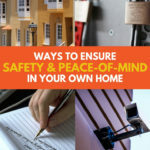 In order to best ensure you’re truly able to enjoy the comforts your home has to offer, these tips can help increase your overall security and peace-of-mind.